We Infuse our work life with action. We honor our clients with compelling solutions backed by a design process that inaugurates a passionate belief, customized and engineered to suit the project we’ve been given, to create and produce the task that will fulfill our client’s goals. But it doesn’t stop there. As we look beyond 2018 whether you’re driving new business products, technological advances, for science, for retail, for higher education or financial services, our innovative performance marketing solutions isn’t just about coming up with new ideas, there’s also the process of how to make our client’s next innovation top gun. So if marketing and communications are your thing, beside the production of a meeting or conference, United Production Group’s talented people find real insights that speak to elusive, multi-tasking solutions. The result are engaging, connected and significant productions that are rewarding, satisfying and company enhancing. 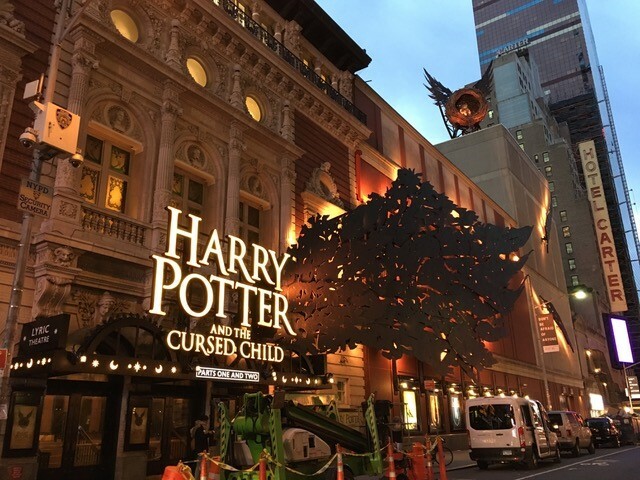 When the play was in the pre-production stage for its grand opening March 2018, David Pedemonti was called upon to propose an extraordinary lighting design to amplify the play’s signature winged structure, the marquis, and the facade of the prominent historic Broadway Lyric Theater on both the 42nd and 43rd Street sides. David, a veteran of theatrical productions, along with his inspired team of technicians, planned a lighting scheme that would serve the requirements of the play, using the best technology available. The design runs 24/7 and has two completely different looks that change throughout the week reflecting the feeling of Part One and Part Two of the play. David and his team, from concept to installation supported a distinctive design that met schedules and budgets. The United Production Group is a foremost, management friendly company that embraces innovation with a quality to champion the success of companies seeking to succeed with style. We respect our clients’ time; go the extra mile to give our clients the service they deserve, and go all out for our clients to improve their client’s experience. We engage our clients where personal interaction, not sales, takes center stage. By putting relationships first, our clients feel that we have a personal stake in their business. Whether we provide Meeting Production and Staging, Video and Film, Exhibit Design and Build, Branding and Corporate Identity Programs, Performance and Training, Consumer Events, Team Building, Experiential Event Design, Galas and Special Events, Concerts and Music and Entertainment, UPG’s design innovation that cuts product and event planning costs, that eliminates costly redesigns, are the things that truly differentiate us from others. Seeking a solution to a problem? Need advice about planning your next project? We’re ready to help anytime, in any situation.